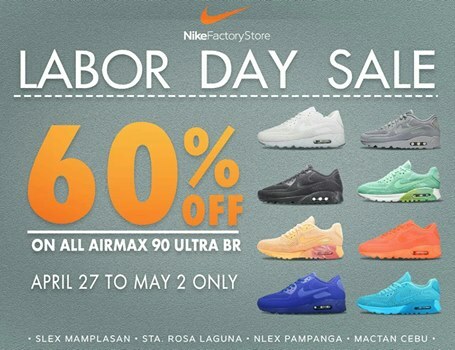 Don’t forget to check out the Labor Day Weekend Sale happening now at Nike Factory Stores! Labor Day weekend has become synonymous with fantastic deals and great offers on ALMOST everything. Make this long weekend special. 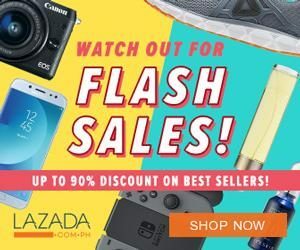 Treat yourself with a new pair of running shoes from the leader in the industry. Shop at Nike Factory Store (NFS) and The Outlet Store Riverbanks Marikina until May 1 and enjoy up to 70% off on selected items. The NFS Subic branch opens as early as 9:00 am until April 30 while The Outlet Store Riverbanks Marikina opens by 10:00 AM. Credits: Nike Factory Store Philippines Facebook Page. This is the first official Nike Factory Store in the Philippines under The Outlet People Inc. 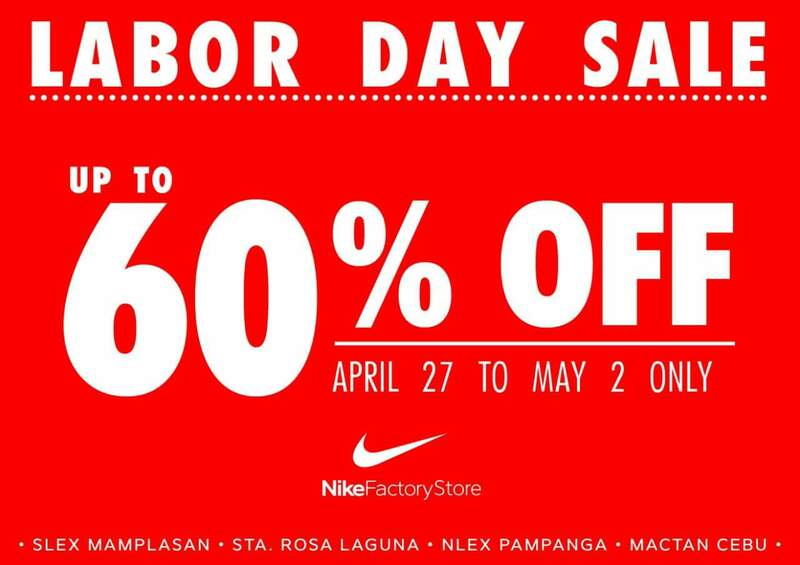 The Labor Day Weekend Sale FEVER has also reached the NFS branches in Paseo de Sta. Rosa, Laguna, SLEX Mamplasan, NLEX Pampanga, and Mactan, Cebu. 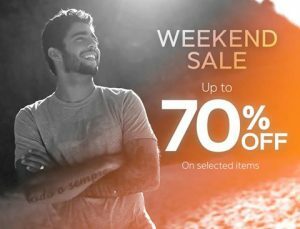 Enjoy up to 60% discount on selected athletic footwear, apparel and accessories. The Nike Air Max 90 Ultra BR is also up for grab at 60% OFF at these 4 NFS outlets. This offer is available during the weekend sale but will extend until May 2, 2017. The Nike Air Max 90 Ultra BR is a modern version of the original Air Max 90. Just so you know, “BR” is short for Breathe. It is referring to these models’ tufted breathable mesh uppers that is designed for wear during the warmer seasons. This updated silhouette is extremely lightweight. Credits to: Nike Factory Store PH official Facebook Page.